In PowerPoint Online and in PowerPoint for Office 365 (on both Windows and macOS), you can insert online videos from YouTube and Vimeo. In other versions of PowerPoint, YouTube videos are the only online videos you can insert. If you'd like PowerPoint to support videos from other channels, please send us your feedback. 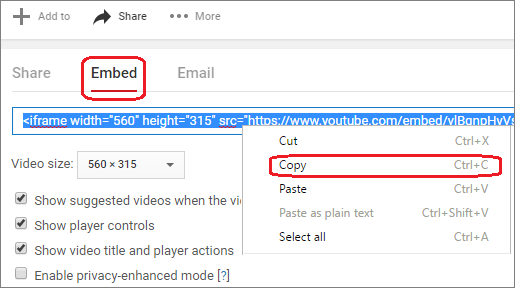 Error: "PowerPoint can't insert a video from this embed code"
See the following procedure for instructions on copying the embed code from YouTube. Find the YouTube video that you want to insert. Below the video frame, click Share, and then below that, click Embed. Right-click the embed code, and click Copy. In PowerPoint, click Video > Online Video. Right-click the From a Video Embed Code box, click Paste to paste the embed code, and click the arrow. On the Slide Show tab, click From Current Slide to view and play the embedded video. You may need to click the video placeholder to get the preview image to appear the first time. If your video doesn’t embed correctly, read Requirements for using the PowerPoint YouTube feature and ensure that you have the necessary updates installed for your version of PowerPoint. In PowerPoint 2010, the ability to play a YouTube video is broken, as explained below. YouTube videos on PowerPoint 2010 have stopped working. In September 2017, Google retired the Flash Player infrastructure that PowerPoint 2010 depends upon for playing YouTube videos. The most effective method of resolving this issue quickly is moving to a newer version of Office. You can also use PowerPoint Online, which is free and can be used with a Microsoft account (Hotmail, outlook.com, live.com). PowerPoint Online allows for the insertion and playing of YouTube videos. You can insert a video by following the instructions in the next paragraph, but PowerPoint 2010 isn't able to play the video. However, newer versions of PowerPoint are able to play the video. In PowerPoint 2010, click Video > Video from Web Site. Right-click the Insert Video From Web Site box, click Paste to paste the embed code, and click Insert. Important: If you see Video from Web Site in the drop-down menu but it is disabled or grayed out, make sure you have Adobe Shockwave Player installed. PowerPoint requires the video-playing technology in Internet Explorer to play an online video that's embedded on a slide. Use Internet Explorer 11 on Windows 7, Windows 8/8.1, and Window 10. Use Internet Explorer 9, Service Pack 2 on Windows Vista. Internet Explorer itself isn't required to be open during the playing of the video; PowerPoint simply uses its underlying technology when playing the video.